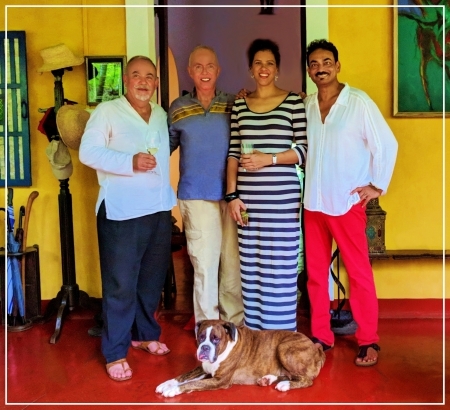 With fashion designer and writer Wendell Rodricks (right), his partner Jerome Marrell (left), model Charmaine Shackleton, and Sophia posed too. After Sri Lanka I flew north to Chennai, Goa, and Delhi. I'd had amazing luck avoiding rain all summer, but now I was really asking for trouble ― India in the rainy season! Against all odds, rain never once came down when I was out and about. It sometimes rained in transit but would stop on arrival. Seriously. Chennai is not a famous tourist destination. But, rather than endure a terrible airport layover, I decided to spend several days and check it out. In Chennai, I fell under the spell of the country's savory, irresistible cuisines. Starting with paper dosas with breakfast, chapati with lunch, and lachha paratha with dinner feasts, delicious daily overdoses ensued. 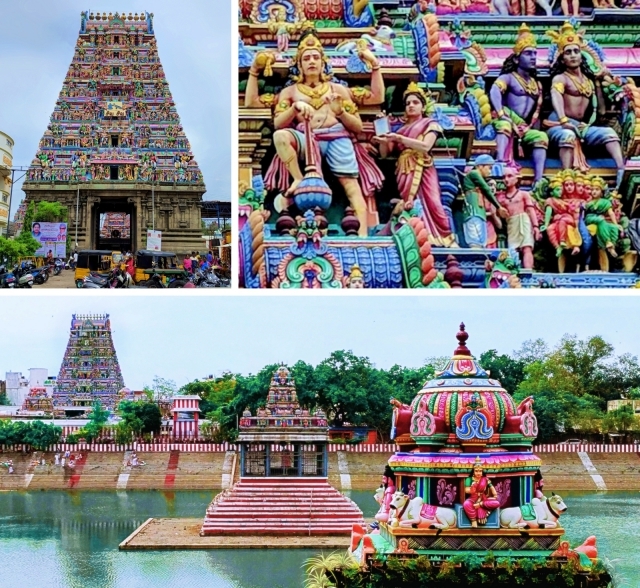 The Kapaleeswarar Temple like most is packed with colorful symbolic sculptures. (1) Christ portrayed standing on a lotus blossom (often in Buddhism) with two peacocks (common in Hinduism as well as early Christianity, and also a symbol for the local area). (2) Many believe the apostle Thomas was an evangelist in India, was martyred nearby in 72 AD, and is buried in this church. Top: Marina Beach, India's longest urban beach, is 6 km (almost 4 miles) long. Bottom: Colorful houses in the Nochi Nagar neighborhood. Goa had been a small Portuguese-ruled enclave for 451 years. But in 1961, the peaceful, nonviolent Indian heirs of Gandhi used their battalions and bombers to attack. Today Goa is one of the smallest and least populated (1.5 million) of the 29 states in India (population over 1.3 billion). Residents of Goa have higher average incomes than those of any state; only the special district of Delhi is higher. Goa is one part of India that I'd not visited and most wanted to see. And one cool party alone made it worth the trip. A few years earlier I met Wendell and Jerome on an African cruise and their hospitality in Goa was wonderful. They threw a perfect party at their Portuguese colonial home: an eclectic mix of engaging guests and a creative buffet in a setting of bold colors, varied art and artifacts. The party was actually mentioned in the Mumai Mirror. Enjoyed the conversations and forgot to take photos. Rajeev Manikoth took these candid shots. The day before the party I visited Wendell's boutique. Bought one of his shirts which I wore to the party. See top photo. 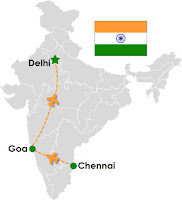 Goa is popular for its many beaches and they are packed hip-to-hip in the high season. This is Miramar Beach in the low (i.e., rainy) season. 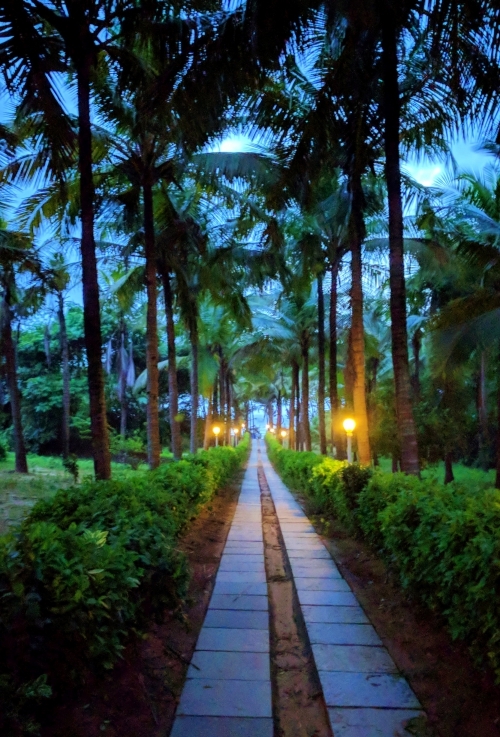 Unusually nice walkway to Baga beach. Big waves slamming into this pier by the Dona Paula beach. These Indian guys were not going to run away. Traffic is jammed in the low season. Cannot imagine high season. This striking new bridge over the Mandovi River should help soon. The Portuguese Catholic legacy includes spectacular churches such as Sé Catedral de Santa Catarina (built in 1510) and the Basilica of Bom Jesus (1605). Christians are still a nontrivial minority (25%); a majority (66%) are Hindus. Delhi was friendlier than I expected in a big, busy city. Above with men at the red fort who wanted a group photo. Guy in a tuk-tuk at a red light who wanted to welcome me to India. Swaminarayan Akshardham, an incredibly beautiful, relatively new (2005) Hindu temple built by followers of an influential yogi. The buildings are more interesting with Indians in front. Left is the historic "red fort." Right is Jama Masjid the largest mosque in India. The tomb of the Mughal Emperor Humayun built in the 1500s. You can see how the Taj Mahal followed in its path in the 1600s. Street in old Delhi viewed from the Jama Masjid. Wanted a photo with Sikhs and then I met these nice guys rocking their hot pink and turquoise turbans. Speaking of colors, this bright yellow saree (aka sari) steals the show from Qutub Minar, world's tallest brick minaret (built 1193). As happened more than once, the sky opened up when returning to the hotel. My last day site-seeing in Delhi, after leaving Qutub Minar, I got another nicely timed dose of India in the rainy season.